Pssst. 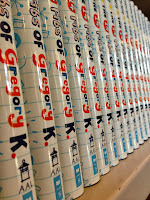 There's a Goodreads giveaway going on with 20 copies of The 14 Fibs of Gregory K. being given to lucky winners. It ends at the end of Halloween, so enter now. 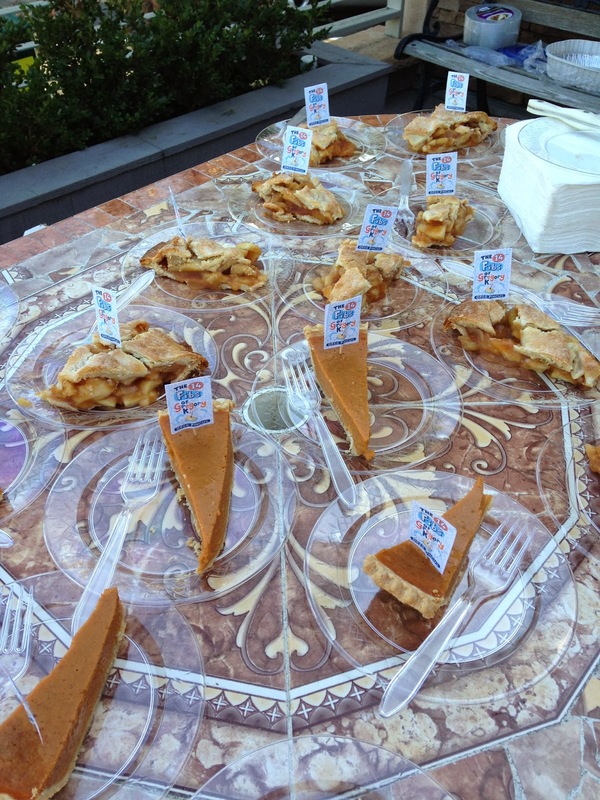 There is no pie... but there might be a book in your future. The new SCBWI.org website is up and running, and it's well worth checking out. And I don't say that because GottaBook happens to be one of the member blogs the site is featuring (though it is!). There are new features, the forums have been combined with Verla Kay's Blue Boards, and much more. You should go check it out and click around a spell. Or, if you happened to be checking it out and ended up here... welcome, and I hope you click around a spell! How Much Do I Hate Math Class Right Now? 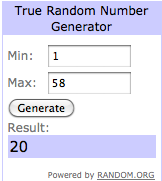 No number equals how I feel. 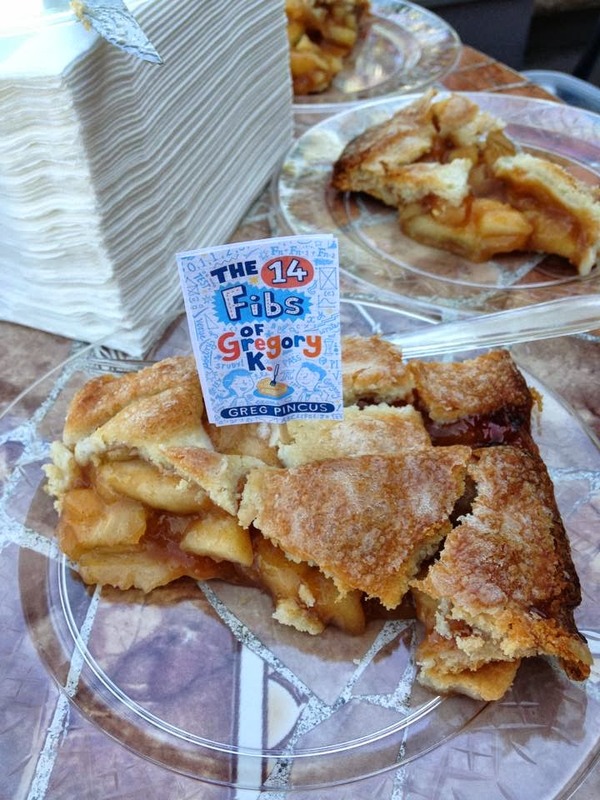 You'll actually find the above Fib in The 14 Fibs of Gregory K., leading off chapter 11. In fact, each chapter of the book, save one, begins with a Fib - a six line, 20 syllable poem based on the Fibonacci sequence as first talked about here back in April of 2006. The Fibs in the book might also be fibs (I'll never tell!) as Gregory K. has a bit of a problem with the truth. The poems also factor into the plot. 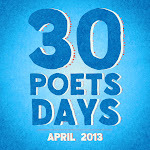 Yup - poetry and math drive the action along with humor and pie. I can truthfully tell you that the idea of chapters having Fibs at the start and the Fibs being fibs stems from the very first conversation Arthur Levine and I had about this book. I'm not sure anything else besides that and the title remained... but this idea was sticky! Need more fun? 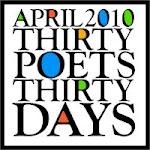 You can check out the Poetry Friday roundup over at Irene Latham's Live Your Poem. Always mighty fine reading. 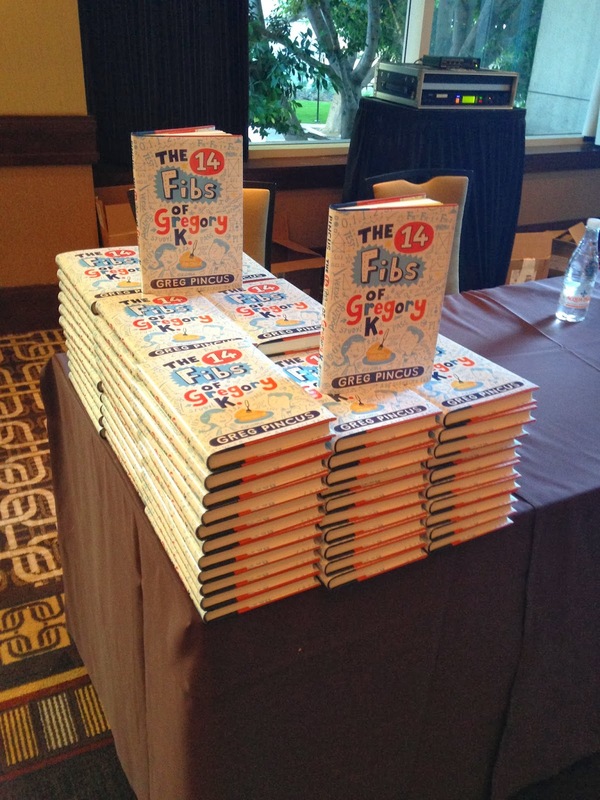 A number of folks have asked the technology behind my live-streaming of The 14 Fibs of Gregory K. launch party and, being a geek and all, I'm glad to talk about it. And I have to tell you - it was as easy as pie! To stream online, the most important thing is an internet connection. The folks at the Flintridge Bookstore graciously let me on their network, so that was solved. 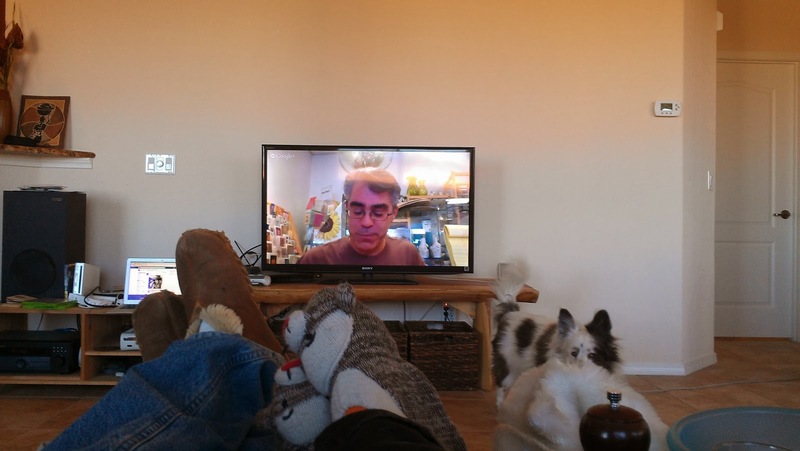 I broadcast using Google Hangouts on Air - a feature of the Google+ social network - and the even was "shot" via my laptop's camera. I added a microphone to the laptop to help with sound. 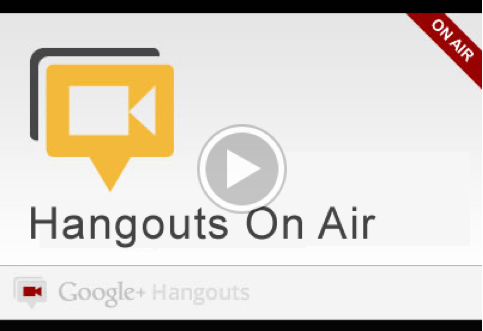 Basically, a HOA, as the Hangouts on Air are called, enables you to start a broadcast and stream it so that anyone can watch it on the "live" section of your own YouTube channel or wherever you embed the video. A HOA can actually have many people presenting, not just a camera on one, so I could have arranged to have, say, editors and designers and others be able to speak to the online audience. The big challenge with that, however, was that I had a live audience, too, and they wouldn't see any interactions that were happening online. So, I chose to just stream me this time, but I see the potential for a lot of great guest/co-host action in the future. I already had a Google+ account and a YouTube account, both of which are needed to do a HOA, so the only pre-work I had to do was make sure the accounts were linked together and "verified." It took me longer to read about what I needed to do than to actually do it! By all reports, the video and audio quality of the stream were fine and dandy. I know there was a lot of downtime when the stream was boring, though during the part I spoke, it was just like being there! I'd work more next time on involving the in-person audience more and having better camera/mic placement. 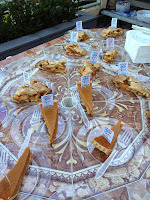 Oh, and sending out virtual pie. Here are some nitty-gritty numbers for you. The maximum measured number of locations accessing the stream concurrently was 19. Over 80% of them were NOT named "Pincus"! I know people watched/listened at different times, too, so I'm gonna peg the number of different locations at between 25-35 based on anecdote. In many cases, multiple people watched at one location. Geographically, folks were all over the US and a couple in Canada, too. 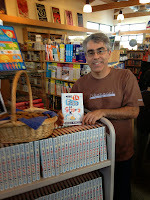 The Flintridge Bookstore had enabled people to buy The 14 Fibs from their website and leave instructions for me who to personalize it to (still going on, by the way), and I signed six books at the launch. Without the party and them creating a buy now button... those sales would've gone elsewhere. Considering I announced this one week in advance, and it was the launch party for a debut novel... I'm pretty pleased. And as far as a proof of concept for me... absolute success. Plus, best of all - it was FUN. Thanks to all of you who joined in, asked questions, shared the news, and have been part of the fun all these years here. And if you have questions, ask away! KidLitCon is happening in Austin in on November 9th... and advanced registration closes this week. You should go! Seriously - hanging out with blogging pals is the best. I am sad that I cannot make it this year... but I'm always there in spirit. 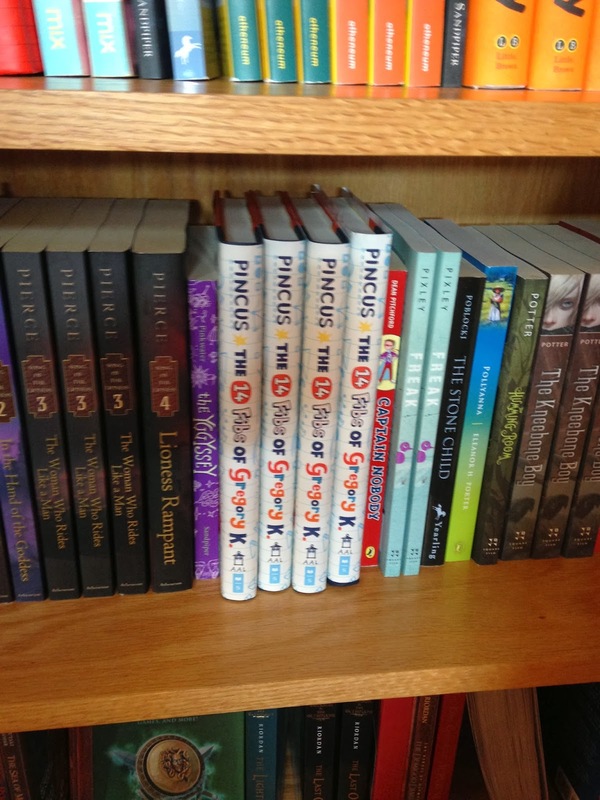 Here's where you can register for KidLitCon7. Go on. You know you wanna. 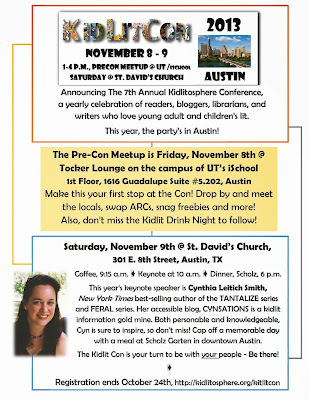 Check out the event on the pretty flyer below (with Cynthia Leitich Smith keynoting - worth the trip alone!). And if you can make it... get thee hence! Well, that was fun! I think I should launch a book every couple weeks or so. Thanks to everyone who came out to the Flintridge Bookstore to join the 14 Fibs celebration. It was wonderful to be surrounded by such great people and to get to express my gratitude and share my glee in person. Thanks, too, to the everyone at Flintridge Books for making the launch as easy and fun for me as it could be. Also, thanks to those of you who watched the live stream! Eventually, I'll edit the video down to something full of highlights, but for those of you who want to watch... you can see it here. The "Greg talking/reading" part starts around 42 minutes in, so just fast forward and it'll be like you were there... though you'll have to fend for yourself when it comes to pie. And also... I'm so grateful to all of you who sent notes, have bought the book, have celebrated with me through the years, and in general been such a part of my journey. The launch is just one part of it - a fun, delicious part - yet I've felt that same vibe from all of you for a long, long time. Thank you! And now... I gotta book. More soon! Until I'm live, you'll see nothing here. 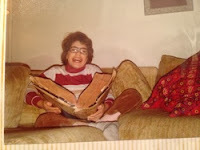 Once I start broadcasting, well, I don't know exactly what you'll see, but it should include me reading a bit from the book, talking about the journey, hanging out with friends, and maybe, just maybe, pie! The launch is happening at the Flintridge Bookstore and Coffeehouse, and you can order a book from their website to have me personalize it (during the launch, perhaps!). I hope to see you there... or here... or wherever our paths next cross. And, as always, thanks to you all for your support and friendship along this journey! I'm excited to say that today I'm lucky enough to be interviewed over on Debbie Ridpath Ohi's Inkygirl. 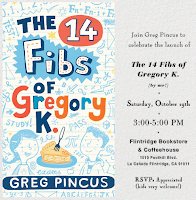 I'm talking about The 14 Fibs of Gregory K., offering up some advice, and yakking about my live-streaming and in-person book launch. And... I'm also thrilled to have a guest post up at the SCBWI blog, this time more specifically talking about marketing (with a focus on my launch and the ability for folks anywhere to get personalized books as part of it). I'm grateful to Lee Wind for the opportunity to be at the SCBWI blog and to Debbie for taking the time to talk and put up a gorgeous looking post! It's true. My website - gregpincus.com - is now live. There's info about The 14 Fibs of Gregory K., a little bit about Fibonacci, and a bio that includes one of my very earliest poems AND that picture of me that graces this post. And more, I tell you. MORE! I hope you'll check it out and let me know what you think. Join Me Online or In-Person at My Launch Party! Get a Signed Book! 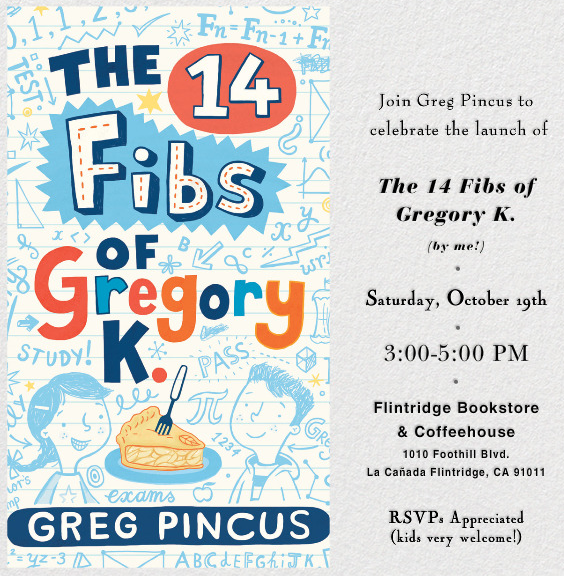 The 14 Fibs of Gregory K. launch party is coming up on Saturday, October 19th from 3:00-5:00 PM... and it's both an in-person AND a live online event. So, if you're in the Los Angeles area, I hope you'll come out to the Flintridge Bookstore and Coffeehouse in La Canada and join me in person. If you can't make it, though, you can watch the party online via this link to my YouTube channel! I am pretty sure you'll also be able to watch it right here on the blog, too, and I'll keep updating such tech things here (and at the Facebook event for this dual party) as they develop. PLUS... you can order a book to be signed/personalized at the party, too. Indeed! Just go to the Flintridge Bookstore website and you'll find my book/me on the front page with a "buy now" button. When you purchase, you'll be asked who you want the book signed to and where you want it mailed. Easy as pie! I hope you can join the celebration - in person, virtually, or just with happy thoughts through the ether. That right there. 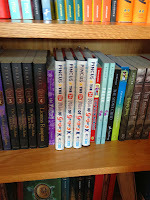 Yeah, that - my book on the shelf (at the Flintridge Bookstore and Coffeehouse, where my launch party will be on Saturday the 19th from 3-5PM, by the way) qualifies as both the thrills and chills of this post's headline. Let me just mention that again - book. on. shelf. Yeah, that rocked. You know what else rocked? Even before this close encounter, I was able to be at the SCiBA tradeshow where I not only got to meet fabulously wonderfully independent booksellers but I also go to sign my first hardcover! And not just one. No - the whole pile! By sheer coincidence, I signed at a table with Ron Koertge who, without knowing it, was the person who had inspired me to really start writing Fibs (and is mentioned in my first Fib post, in fact). I got a copy of his new Coaltown Jesus - skews older than mine and is, as his other books, a great read. Earlier, walking around at the tradeshow I found the Scholastic table. Guess what? Yeah. It's another photo of my book, but let me see if I can set the scene for you. Gah!!!!! 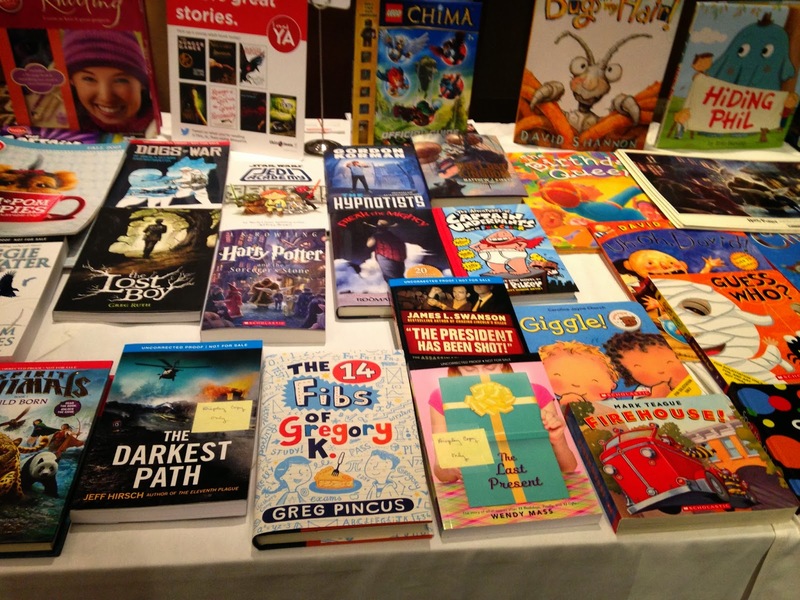 My book on a table with other Scholastic books!!!! Captain Underpants! Harry Potter! 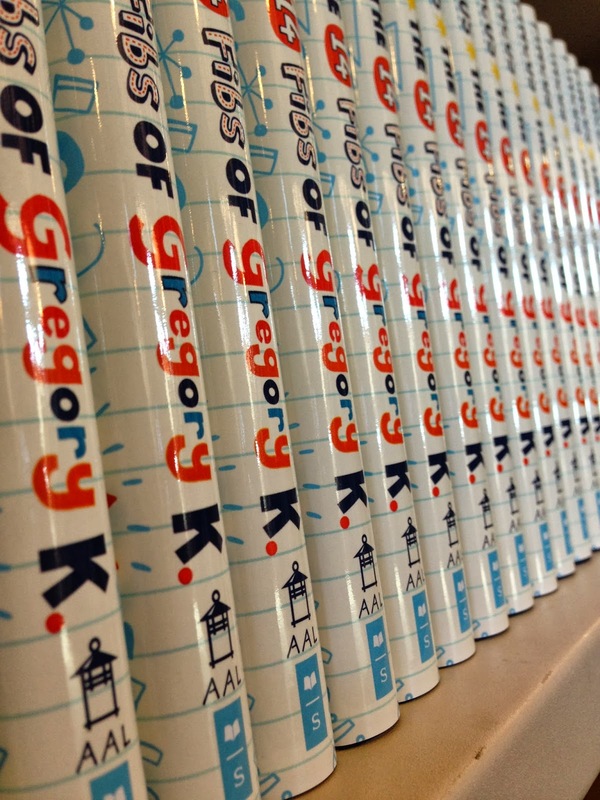 The 14 Fibs of Gregory K. Gah!!!! One of the oddest things I've seen so far is that the very first day my book shipped anywhere, there were already used copies for sale online. Hardcover. Which, like, had never been seen anywhere. Hmmm. While I'm still waiting for my first Amazon review, I've been lucky enough to get some nice reviews on blogs and in traditional review sources, too. 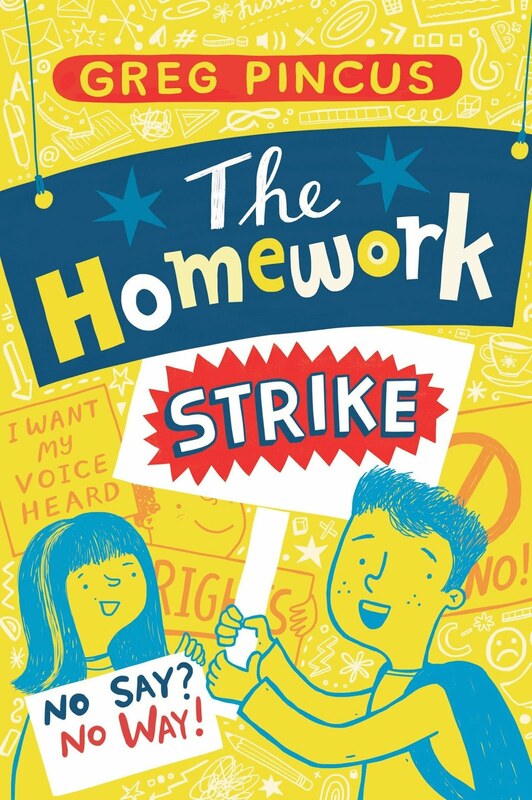 AND, yes, from booksellers and librarians and parents and kids. There is much rejoicing on this end, I admit, when I hear that people actually like the book. As always, it's been a blast sharing the experience with so many of you here, on Facebook, on Twitter, and, yes, in person. The support and camaraderie means a lot, and I'm very grateful for it - in fact, it makes me say.feel "gah!!!!" 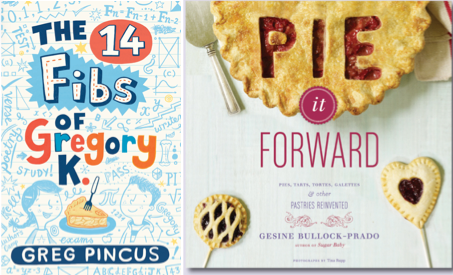 Congratulations to GrandCanyonReadingTeacher - winner of The 14 Fibs of Gregory K. and Gesine Bullock-Prado's Pie it Forward! Thank you all so much for entering the giveaway and joining in my celebration of my book's debut.